You don't have to be fit to start, but you have to start to be fit. Join us now and "Feel the Burn". 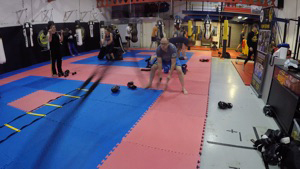 Combat Fitness is a combination of aerobic, strength and marital arts exercises and is one of the most popular fitness trends in gyms in recent years. The American Council on Exercise (ACE), which evaluates exercise products and programs, notes that during a one-hour kickboxing workout, you can burn from 500-800 calories, up to twice the calories you burn during a one-hour step-aerobics class. 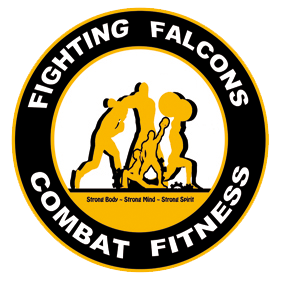 The Team Falcons Combat Fitness programme takes it to another level incorporating strength and functional training that our fighters use to compete at National and International level. Although it may seem as if every new exercise trend is hailed as "a full-body workout," our combat fitness classes are the real deal. 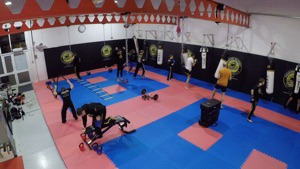 Used by Kickboxing World Champion and Team Falcons head coach Gordon Mitchell to prepare for competition, our combat fitness program provides an intense, total body workout which aims to improve strength, aerobic fitness, speed, flexibility, coordination and balance. 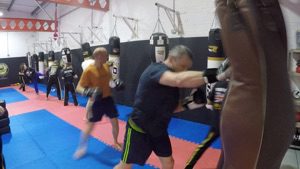 We run 6 week bootcamps from 6am to 7am every Monday, Wednesday and Friday. The price of each camp is £60 and this also gives complimentary access to our evening classes for the duration of the camp. Interested in signing on? Check out our facebook page below for the next bootcamp event. Evening classes run every Monday and Thursday from 7:30pm to 8:30pm. It's a fun session designed for all ages and all levels of fitness. Membership is £40 per month for Adults and £35 per month for anyone in full-time education. For more information about the programme and how to sign up please register your email and phone number and we will contact you directly. Call and sign up now and you can get started with 4 class for just £15. That’s a saving off our normal prices. That way you can see if our classes are right for you. This offer is only available through our website.